Speaking of Dinner with the Girls. 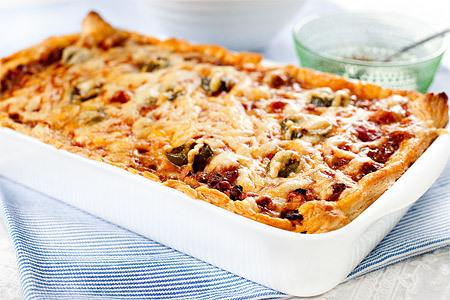 One old time classic for me is the Taco Pie. In the age 12-15 I swear me and my girlfriends made it every single Friday night. And for all the birthday parties. And for every other occasions worthy a taco gratin. Last night it was time again. And the occasion? Sunday Night! This is my favourite recipe. Many others will tell you to put more spices in the dough, add corn, peppers to the filling, nacho chips on top etc but trust me; this time simplicity wins! Fry the onion and mince together until there’s nothing red left visible. Add spice mix and water and let it simmer for a couple of minutes. Pour the mince mix on the pie crust and spread evenly. Do the same with the creme fraiche filling. Finish off with sliced red onion rings and a loooot of grated cheese. Keep in the oven for 10-15 minutes until the cheese has a nice crispy golden look.